Home / News & Events / A Great Week Was Celebrated At The Closing Ceremonies Of The 10th Annual ASC Seniors Games! 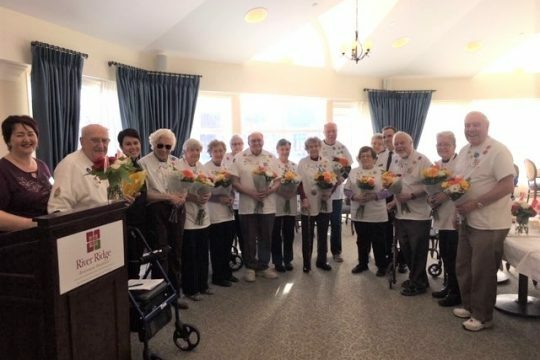 The 2019 All Seniors Care Seniors Games closed across the country today, as Poker, Cribbage, Skip Bo, Trivia and many more games were contested at retirement communities across the country. This year our theme was, Dance! Dance Dance! With dance there are many good things that happen: improved physical health; increased emotional well-being, and even; making a new friend or two in the process. From start to finish, the decade old Games have been a resounding success as witnessed in Winnipeg, Manitoba at Seine River Retirement Residence where one resident commented: “I’m so glad we got to work in teams for trivia I was paired with people I have never talked to before and now I have made 3 new friends!” While at The Courtyards on Eagleson in Kanata, Ontario, we had two centenarians competing today. These lovely ladies, each 101 years young, tossed the bean bags like they were jelly beans into a candy jar. It just goes to show that a healthy lifestyle throughout life can lead you to a fulfilling old age. During the Closing Ceremony at Cité Parkway in Ottawa, as we danced and celebrated, competitors were joined by dignitaries All Seniors Care COO, Lily Goodman, and MPP Effie Triantafilopoulos, the Assistant to the Health Minister. MPP Triantafilopoulos brought greetings from the Premier and closed with a personal observation: “Love the theme Dance, Dance, Dance and in Greek it would be ‘Opa, Opa, Opa’,” followed with a caution to all present that there would be NO breaking of dishes today. All Seniors Care Living Centres Chief Executive Officer, Mr. George Kuhl, extends a heartfelt thank you to all of the Staff and Volunteers across the country for the months of hard work and dedication that made the Games such a tremendous success and a huge congratulations to all participants on the fantastic enthusiasm and efforts this week. Across Canada, thousands of older adults enjoyed the fun, friendly competition and activity that came from participating in the All Seniors Care Seniors Games this week. For information on the 2019 ASC Seniors Games highlights and results please visit our website or check out all the action and photos on social media.